Nutritious and tasty farm produce can be grown in any size garden and location. All you need is an understanding of the vital organic gardening supplies, strategies and plant care routines. Take time to understand your organic garden, its soil nutrient levels as well as your areas’ climatic conditions and patterns. Listed below are seven high-yield strategies that will help you get the best yields. Every gardening expert will recommend building up the soil if you want to increase yields. Organically rich soil boosts the growth of extensive, healthy and deep roots that can reach more beneficial nutrients and water. This, in turn, results to extra productive and lush crops. The quickest way to achieve deep and fertile soil is making raised beds; they can yield more than three times the amount of produce harvested from open space gardens. They also save time and help ensure crops attract fewer weeds. Raised beds are ideal for getting high organic garden yields but their shape does matter. Rounded raised beds that are 5 feet wide at the base and long increase the available planting area. They offer 20 percent more planting space when compared to rectangular or square shaped raised beds. Ensure the crops are properly spaced and try to avoid organized rows or square patterns. Instead, plant in triangles or simply scatter the plants. This allows you to plant more plants while still ensuring they are adequately spaced. Lack of spacing stresses plants and makes them more susceptible to diseases. You can grow more vegetables by embracing vertical gardening. 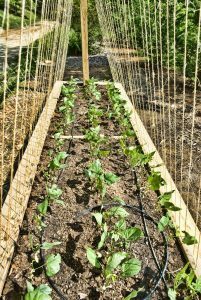 Vining crops like pole beans, melons, squash, tomatoes and cucumbers can be supported with trellises, stakes, cages or fences to grow straight up. Vertical gardening also saves you maintenance and harvesting. Try growing vining crops along the side of the raised beds using a nylon mesh or post. This is known as inter-planting and offers numerous benefits. Corn, beans and squash are good companion plants because they support each other. For instance, corn stalks can support pole beans while squash grows freely helping eliminate potentially competitive weeds. Succession planting allows you to plant and harvest as many as 3 crops from a single area during one growing season. For example, an early lettuce crop can be followed by a quick maturing corn crop and greens or garlic after that. Extending the growing season a few weeks gives you time to plant and harvest a succession crop or to harvest more produce of existing crops.